If your doctor suspects arthritis, he will order x-rays or other imaging studies of your painful joint. X-rays will show if there is any evidence of cartilage loss. X-rays do not detect early cartilage abnormalities, though — and there is not always a direct correlation between the severity of damage evident on x-rays and the severity of symptoms. X-rays can show mild osteoarthritis while you may be experiencing severe symptoms. The reverse is also true — an x-ray may show changes that point to advanced osteoarthritis while you may be experiencing few if any, symptoms. 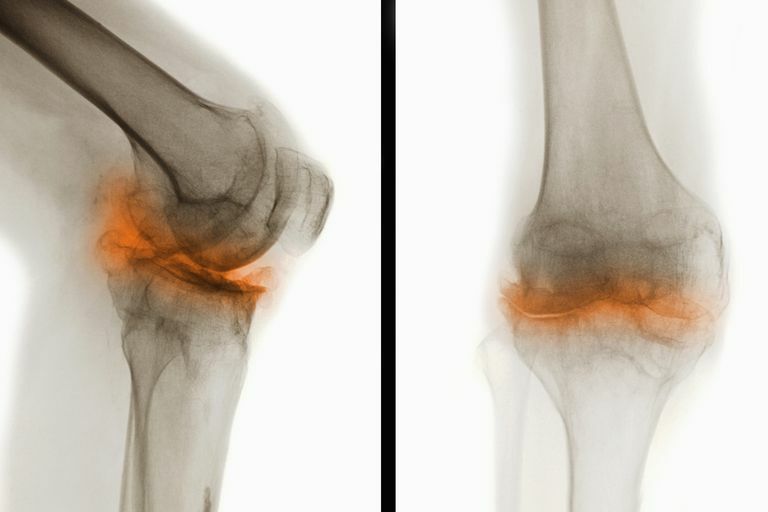 Even though early cartilage abnormalities are detectable with magnetic resonance imaging (MRIs), usually x-rays are ordered initially to help diagnose osteoarthritis. Joint Space Narrowing: If the joint damage that appears on x-ray is severe, you may be told that you are "bone-on-bone." Bone-on-bone is a layman's term that refers to complete joint space narrowing, which is the result of cartilage loss. As cartilage deteriorates, there is less cushioning between the ends of the bone that form the joint. The space between the ends of the bone decreases and the ends of the bone become closer to each other. When there is essentially no cartilage left, the bones rub against each other. The term bone-on-bone refers to the ends of the bones rubbing against each other. A Disease of the Cartilage: Osteoarthritis is primarily considered a disease of cartilage. As cartilage wears away, the role it serves as a shock absorber and lubricant (to protect the ends of the bones and allow friction-free movement) is affected. Healthy cartilage works in harmony with bones, muscles, tendons, ligaments, and other support structures to maintain joint function and mobility. When a joint is at an advanced stage of osteoarthritis and has become bone-on-bone, the range of motion can be very limited and it is typically very painful. How Serious Is Bone Marrow Edema?